Easter Egg Made with Single Origin Dark Chocolate and Cacao Nibs, Filled with Dark Chocolate Clusters. Single origin Colombian 70% cacao Easter egg. Chocolate and cacao nib clusters inside. Lovingly handmade in Cornwall. Gluten Free. No artificial flavours or colours. Suitable for vegans. 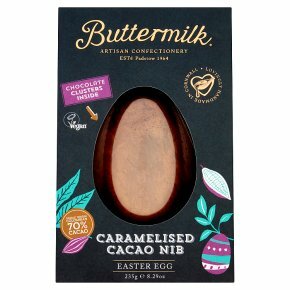 Suitable for vegans* *Our Cacao Nib Easter egg is made in our kitchen alongside products containing milk. We believe it is suitable for vegans, but we can't guarantee that it is completely free from traces of milk. Open up our Easter Egg made from 70% single origin Colombian dark chocolate with caramelised cacao nibs, to find if filled with indulgent, dark chocolate cacao nib clusters. The ultimate Easter treat for dark chocolate lovers.